Florida has become one of the world's strongest tourist magnets. As a III's program participant you will have an opportunity to visit any of the places mentioned below and join various offered activities. Enjoy browsing online through the places we have selected for you based on the former participants' list of popularity, but remember that this web has too limited space to include everything Florida has to offer. Just about 2 hours drive from LaBelle is one of NASA's headquarters. Famous Kennedy Space Center and Cap Canaveral are the places where you can tour rockets launch areas, meet an astronaut, see giant rockets, train in spaceflight simulators and even view an orbital launch. Read more about NASA and look for its related websites here. During your stay in Florida, you definitely want to use the chance, explore and enjoy a diverse world of water trips, educational and adventure tours. Below is just a few of them, experienced by our visitors and suggested as really worth trying. If you want to learn more about equipment and accessories, paddling skills and safety, how to deal with Florida's little unpredictable weather as well as get an idea of favorite kayaking locations, select the "Florida Kayak Trips" header of this text. Snorkeling is fun, safe and easy. III's program participants join underwater tour to the shallow, inner coral reefs located at the Key Largo National Marine Sanctuary and have been absolutely amazed at the underwater world that lives just offshore of Key Largo, only 4 hours drive from LaBelle. Diving is another fun activity that is easily reachable in LaBelle's few hours drive radius. Our program participants organize from time to time a weekend to Florida Keys, where they receive from professionals basic introduction to enjoying the underwater world and then come back to LaBelle with wide smiling faces, describing all the amazing experiences they just went through out there. Key West is a very magical place. If you have visited here before, you are probably still talking about your vacation here and have some fond memories of a fabulous Key West sunset, walking down an Old Town Lane and smelling the jasmine or singing along downtown to a popular duo at one of the bars on Duval Street. If you have never been here before, you are in for a real treat. 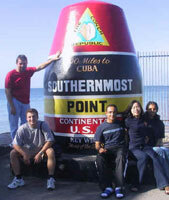 There is a Key West attraction for every person. You can enjoy a relaxing trip on a smaller charter to view dolphins in the wild or to kayak in the backcountry off Key West. Fort Myers Beach is very lively with lots of family restaurants and bars along Estero Boulevard and attractions such as boat cruises, mini-golf courses, factory outlet shopping and the house of Thomas Edison (he liked it so much here that he brought his house down from New England and rebuilt it). Between November and March, you have the added pleasure of manatee spotting and you can spy dolphins year-round. Just 45 minutes ride from LaBelle! The Everglades and the Ten Thousand Islands are rare and beautiful places. They are one of North America's unsung wild places - a beautiful, rugged, subtropical landscape experienced by a relatively few adventurous souls each year. Many, who appreciate the unique qualities of this wilderness, will argue that it is a place better kept secret. Just 1 hour ride from LaBelle is one of the national park official entrances.